The 2018 Nissan Maxima continues to prove why it is the flagship sedan for Nissan. This sedan offers higher performance mixed with stand-out luxury features that make this sedan feel like a luxury car. This sedan grabs the attention of those around it and offers a smooth ride with expert handling, as well as a decked out interior. New for the 2018 model year is Android Auto, which joins NissanConnect and Apple CarPlay. Other features include some options that were made standard in the 2017 model year, such as automatic emergency braking and forward collision warning. We know you’ll love this stylish stand-out as much as we do! What safety equipment is featured in the Maxima? The 2018 Nissan Maxima comes standard with many different safety features. Some of these features include automatic emergency braking, intelligent forward collision warning, supplemental front airbags, rear outboard occupant head protection, front seat-mounted side-impact supplemental air bags, and even a rearview camera. Higher trims offer blind spot warning, rear cross traffic alert, intelligent cruise control, front and rear parking sensors, active engine braking, and NissanConnect. How many trims are available for the Maxima? You may be asking how many trim levels this extraordinary car offers, and the answer is five! For the basic Maxima, you can choose the Maxima S, which offers satellite radio, an eight-speaker audio system with a CD player, Apple CarPlay and Android Auto integration, two USB ports, an eight-inch touchscreen, a navigation system, a 60/40-split rear seat, power-adjustable front seats, a leather-wrapped steering wheel, adjustable driving modes, dual-zone automatic climate control, an auto-dimming rearview mirror, keyless entry and ignition, remote engine start, fog lights, LED daytime running lights, and 18-inch wheels. For a mid-level option, you may consider the Maxima SV, which adds an upgraded driver seat with extendable thigh support and two-way power lumbar adjustment, leather upholstery, heated front seats, heated mirrors, and front and rear parking sensors. A sportier option is the MAxima SR, which gives you active engine braking, Active Trace Control, Active Ride Control, column-mounted paddle shifters, a sport-tuned suspension, and 19-inch wheels. However, the most luxurious Maxima is the Platinum. This premium model gives you NissanConnect services, a rear power sunshade, upgraded leather upholstery and interior trim, a six-way power passenger seat, driver-seat memory settings, a power-adjustable steering column, a 360-parking camera, an auto-dimming driver-side mirror, Active Trace Control, and even Active Ride Control. What engine powers the Maxima? The engine that powers this impressive sedan is a 3.5-liter V6 that can generate 261 lb-ft of torque and 300 horsepower. This engine connects to a Xtronic continuously variable automatic transmission and can be found in front-wheel drive. As for fuel economy, the Maxima can get 21 mpg city and 30 mpg highway. That is impressive fuel economy for such a powerful standard engine. Looking for a sedan that has it all? 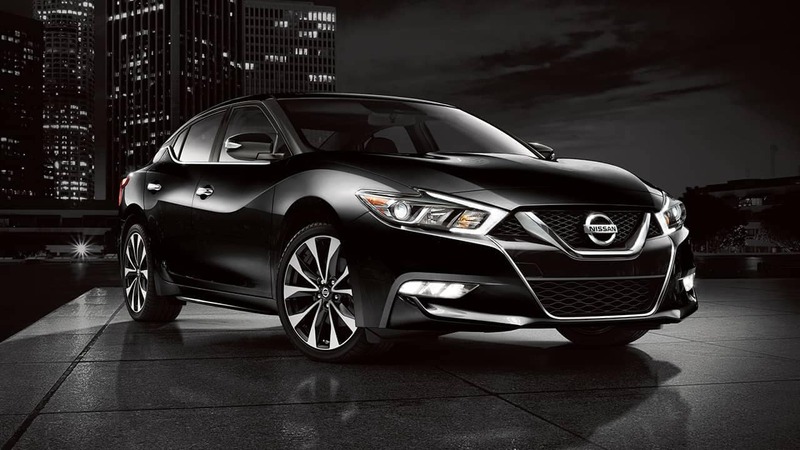 Look no further than Nissan’s flagship sedan, the 2018 Nissan Maxima. This sedan features a powerful standard V6 engine, outstanding fuel economy, and technology that will help further assist you with all of your driving needs. Schedule a test drive today!